brand new 4 pot calipers , grooved discs , kevlar pads from £279 !! We have tested some of the Subaru 4 pot copy calipers and found them to be pretty good , so we are now offering them in our line up. We are offering a pair of brand new 4 pot calipers , grooved 294mm discs with painted centres , our kevlar sport pads , and pad fitting kit for £279 inc vat ! Last edited by Godspeed Brakes; 16 November 2011 at 09:35 AM. We can also offer them with the standard fitted mild steel pistons not our stainless steel pistons , and can offer the full kit for £279 !! Very cheap considering what second hand sets are going for these days ! Before I stumbled upon my latest set of Brembos I was bidding on WRX 4 pots, but refused to go over £200 for second hand calipers from 05 cars ! Hi Ian, what would you charge for a set of calipers (with stainless pistons) on their own without pads and discs? Do you think its possible to machine the logo off the front? It shouldn't affect the calipers should it? That is a cracking price if they work the same. Ian, how much for a full set of the pistons you have removed from these calipers please? Hi Ian, i PM'd you the other day, don't suppose you had a chance to have a look? Ian, are you still supplying these calipers? The inner pistons in my Subaru 4 pots have seized, inner face of discs are rusted as a result so presumably I will need to replace the whole lot - calipers, discs and pads. What are my options? The car is an MY00 Classic. You have 2 options , either exchange your calipers for a pair of original Subaru 4 pot calipers fully reconditioned with new seals and stainless steel pistons that will never rust , along with our 294mm grooved painted centred discs and kevlar pads for £335 , or with bluestuff or orangestuff pads for £425 , we have your calipers back on an exchange basis to recondition for the next customer. Or the other option is the copy WRX PRO caliper kit but this kit is now £299.50 as we have some increases in prices ourselves. Thanks Ian - how much is the WRX PRO kit with stainless pistons? And if I went this route do you buy back used Subaru calipers for your refurb stock?? Yes we do buy calipers in need of reconditioning , we pay £80 a pair for them as long as the casting are not cracked , and the threads are intact. i fitted these recently, and they have transformed the braking..bedded in nicely and now have really great brakes....only one negative ive noted is that the discs have started to rust where the pads dont contact the disc face ...and they have only been fitted 2-3 weeks ....yes i know we have had alot of rain but car is a daily driver ..any input ian?? All discs rust, perfectly normal. What would be the cost for just the calipers with pad pin kit shipped to the USA, 92677? What he said,the only way not to get rust is if its a garage queen.and never driven in the rain or washed. SJ. I've got the pads & rotors already, I just need new calipers. I imagine shipping the whole kit would be expensive. There's no way you can make a special exception? Ian, i already have the front set, do you do a set for the rear? 51 plate blob. I think i may have a dodgy rear calliper, however how much for just the discs and pads, yes it is 2 pots on the rear. If i cant free of the calliper, do you sell the WRX PRO rears? 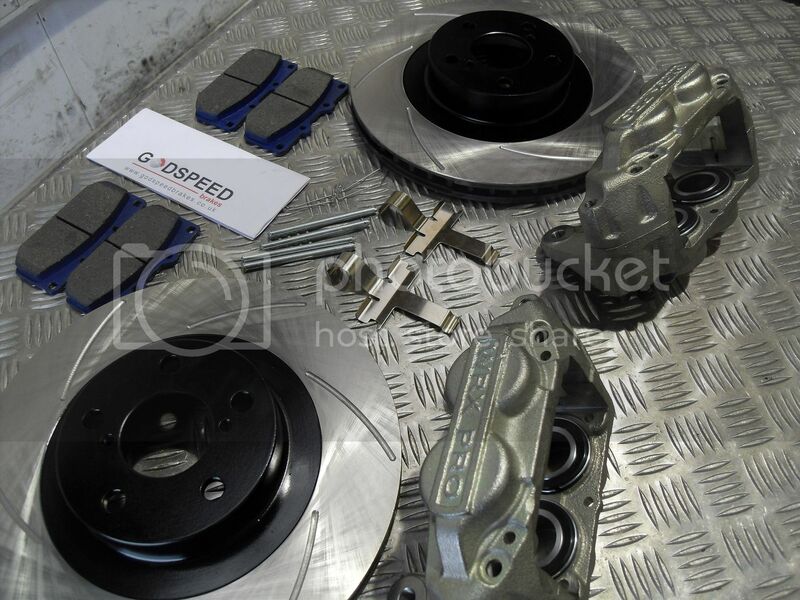 Quick Reply: brand new 4 pot calipers , grooved discs , kevlar pads from £279 ! !